Agriculture in the Delta area began during the Gold Rush period to fulfill a need of food for workmen and hay for horses and other livestock. No other significant agricultural development occurred in the area until the 1950s when several homesteads were established in the Clearwater area. Through the perseverance of these hard-working people, the viability of agriculture in the Delta-Clearwater region was proven. 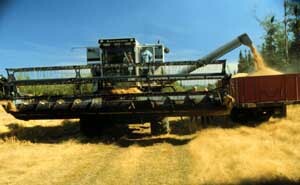 In the early 1970s, a large scale commercial farming venture was established. Though beset by a multitude of problems – including limited or non-existent markets for production, difficulties in obtaining needed production sup-plies and the ever-present wildlife depredations. This farm did demonstrate the potential for local grain and forage production. 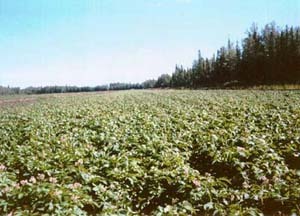 It was partially due to theses efforts that Delta-Clearwater was chosen as the location for Alaska’s first large-scale agricultural project. The original 60,000-acre demonstration project started in August of 1978. Twenty-two parcels, averaging slightly more than 2,700 acres in size were sold by lottery. An additional land release of 15 parcels totaling 25,000 acres took place in early 1982. Along with two large agricultural projects, the Delta area also has many small farms. In several different land sales, over 100 parcels were sold in the Tanana Loop and Delta-Clearwater areas. These farms ranged from 20 to 320 acres in size. The infrastructure created to service the larger farms also serves these new farms and several older farms which were homesteaded during the 50s and 60s. Smaller farms contribute to the general economy and are recognized as an important part of the agricultural picture. Success of the Delta Agricultural Projects has been highly variable. The development of more than 80,000 acres of agricultural land is an accomplishment in itself. Farmers have adjusted their production techniques to make the most of Mother Nature’s short season by raising cereal grains such as barley and oats, grasses for forage and seed, certain hardy annual legumes, potatoes, vegetables and livestock. Bison, elk, European boar and reindeer ranching is currently under serious consideration. Although severely impacted by the current international agricultural situation, Delta area farmers continue to plan for the future expansion of the industry. Opportunities in the production of finished beef, dairy beef and swine are strong possibilities. Our local dairy processor could expand the available markets if more milk was available. Processing facilities could open new markets for local vegetable and berry production – Various types of game ranching may also have an economic future in Alaska’s agriculture. Opportunities do exist for Delta farmers. 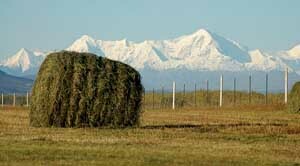 One might wonder how much agricultural production can be utilized in Alaska’s effort to become self-sufficient. If Alaska were to produce 100 per cent of the beef, pork and milk currently consumed in the state, it would require full production on more than 600,000 acres. We have ample opportunity for expansion.